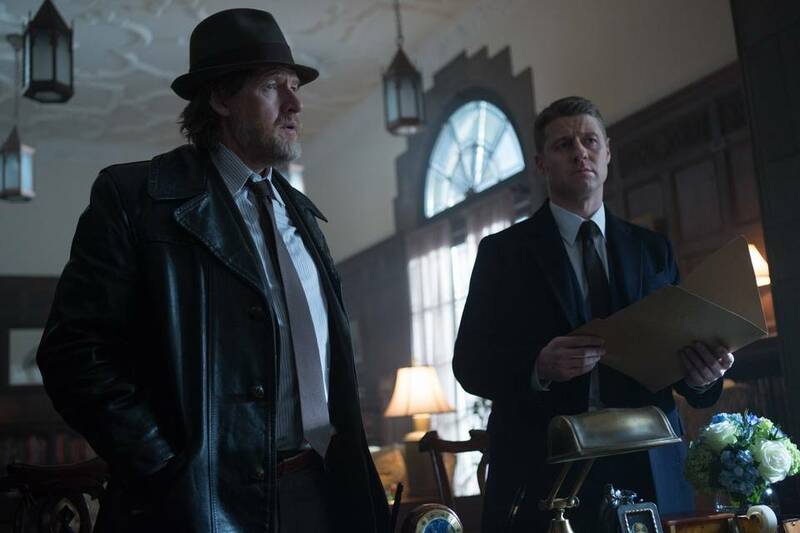 There’s a lot going on in the latest offering from Fox’ “Gotham”, So I’ll just jump right in. 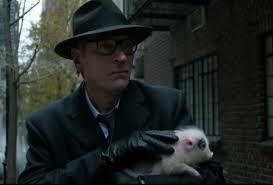 Gotham, at it’s best, is a really good show. It’s dark yet humorous and bleak. At it’s worst, it is everything that is wrong with Comic Book adaptations and Crime dramas. Last weeks “The Fearsome Doctor Crane” was, unfortunately, one of the latter. This weeks offering “The Scarecrow” improves a bit on last weeks debacle, but it still feels a bit disjointed and frantic. A lot of the scenes don’t work entirely well in the context of the episode. Luckily there are some great performances (as always) that help to elevate this episode, though not much. Even Bullock is skeptical about that. This week we pick up almost right where we left off. Last weeks villain- Doctor Gerald Crane- is still at large and collecting the adrenal glands from his victims. We learn that he is doing this in order to make a “fear serum”, something that will “cure” human beings from the evolutionary disadvantages of fear. Putting aside the wonky pseudo science, there are still a few problems with the execution of the character. First we learn that he is a high school teacher. No problem in and of itself except that it is extremely rare to find a Doctor teaching at even the most illustrious of High Schools. On top of that, we have the problem with the principle. Consider this: one of her self described “great teachers” goes missing for three weeks. She doesn’t inform the police and makes no effort to contact any loved ones. It’s only when the police come to her that she makes the leap of logic that Crane must be going after the adrenal glands of phobic people because of a scientific paper he asked her to proof. I’ll say that again- a high school teacher asked a high school principal to proof a scientific paper. That just doesn’t happen. Beyond that, Crane’s development in this story is boring, if well acted. He is holed up in the house where his wife was kileld by a fire years ago as he tries to make he “fear serum”. Apparently you can do that by squishing them, adding some water and another mystery compound and then injecting it into yourself. Again, I’ll not comment on the wonky pseudo science. More important, and much more subtle, is the development of his son Jonathon Crane. Any readers of the Batman comics will know him more colloquially as “The Scarecrow”. And that brings me to the title of the episode: why “The Scarecrow”? The aforementioned farming tool in the Crane’s backyard is seen only twice. Perhaps it would have lent a little more weight to the story to have Jonathon talk about how the Scarecrow always scared him as a child or something along those lines. In any case, it made the ending confrontation between the Cranes and the GCPD lacking. Yes, last week he used a pig to nearly scare someone to death. As of last week, the M.E. position at the GCPD has opened up thanks to a brilliantly hilarious move by Mr. Edward Nigma, and we were left with Jim proposing that his girlfriend Doctor Leslie Thomkins takes the job. The episode immediately opens up with her being hired by the GCPD but being apprehensive about it as she thinks it will interfere with her and Jim’s budding love affair. This conflict seems very forced, to say the least. Both of them have been professionals in their fields long enough to know that at work you must maintain a professional atmosphere. Jim is okay with this, whilst Dr. Thompkins wants to run around pretending to be a high schooler, sneaking in kisses and the like. For someone who has come across as so mature and professional in previous episodes, this doesn’t make a lot of sense. And then at the end, she just dismisses her attitude by saying “just kidding”. It is an unendingly annoying and superfluous thing that women do: drive men crazy with their immature behavior and then rectify it by saying “just kidding”. The thing is- it is a behavior most notable in emotionally immature women and manipulators, neither of which Dr. Thompkins seemed to be in previous episodes. Obligatory picture of Ms. Morena Baccarin as Dr. Leslie Thompkins. Just because she is so gorgeous. And lastly there is the scenes with Fish Mooney in some sort of pirate prisoner camp- an anachronistic statement in and of itself. Even though in the last episode she was scene having a fierce clash with one of the pirates which lead us to believe she wasn’t just going to give up and be taken…she is. The three or four scenes with her just lack any real energy and serve to slow the story down, and her eventual take over of the pirate prisoner gang is like watching a fixed fight. Not exciting, not interesting and a waste of time. Only the best for Mrs. Kapelput’s only son. One actor whose performance always lights up whatever episode he’s in is Robin Lord Taylor as Oswald “Penguin” Cobblepot. As of last weeks episode, his snitching on Don Maroni to Don Falcone has been uncovered and he has come running to Falcone for protection. John Doman, sadly absent from the past few episodes, comes back in full force as his newly reborn, vicious gangster self. He is up to his old tricks and his old cruelty, and Mr. Doman does a good job of conveying the idea of a contained explosion in the mob bosses eyes. But back to Penguin. For the first time in this episode we get a scene between our two neurotics- Penguin and Nygma. And it plays out just as awesomely as you think Both young actors play characters who are testing each other out for reasons that neither one of them can explain. It’s a terse chess match between two mental giants that I hope the writers and producers play out some more throughout the run of the series. Finally, I’ll talk about the one part of the story that is well done throughout- Bruce Wayne. 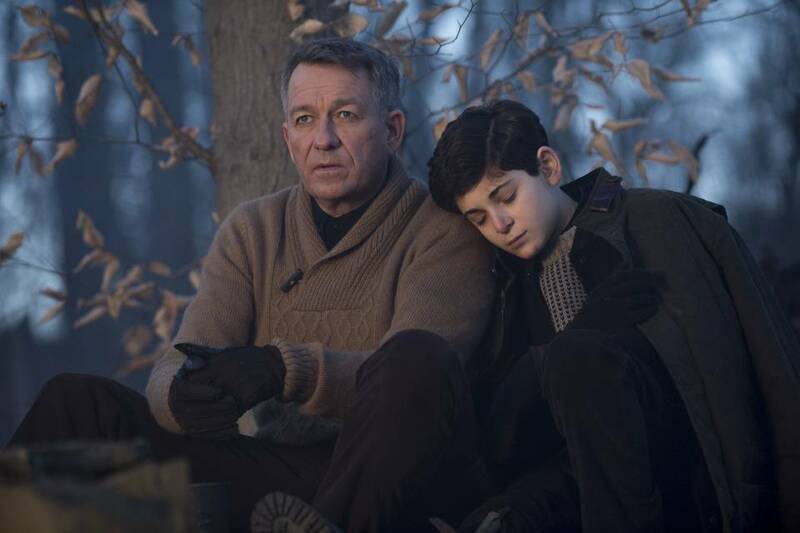 David Mazouz (as Bruce Wayne) and Sean Pertwee (as Alfred) have really succeeded in showing a tenuous father-son relationship between the two characters. One particular scene that stands out comes when Bruce destroys a sort of monument that he and his father had been building from rocks. Without wasting any dialogue, this shows the anger and frustration and confusion that the young Bruce must feel towards the entire situation. Bruce then slips down a hillside and sprains his ankle, struggling his way back up the hill only to find Alfred sitting there at a campfire. In their interactions, we see how it can be argued that Alfred groomed Bruce to become the man he eventually will be. A beautiful moment between two great characters. David Mazouz as Bruce Wayne. The young actor isn’t given many lines, but he capitalizes on them with just the right amount of emotion and passion. Though a few acting tweaks could be made, I’m excited to see where he takes the character. Sean Pertwee as Alfred Pennyworth. After seeing Pertwee’s portrayal of the Wayne Family butler, I wonder how it can be justified to portray him any differently. Robin Lord Taylor as Oswald “Penguin” Cobblepot. Mr. Taylor (Lord Taylor?) continues to excel in his role as the slimy, weaselly mob underling, lying and manipulating his way through the ranks. 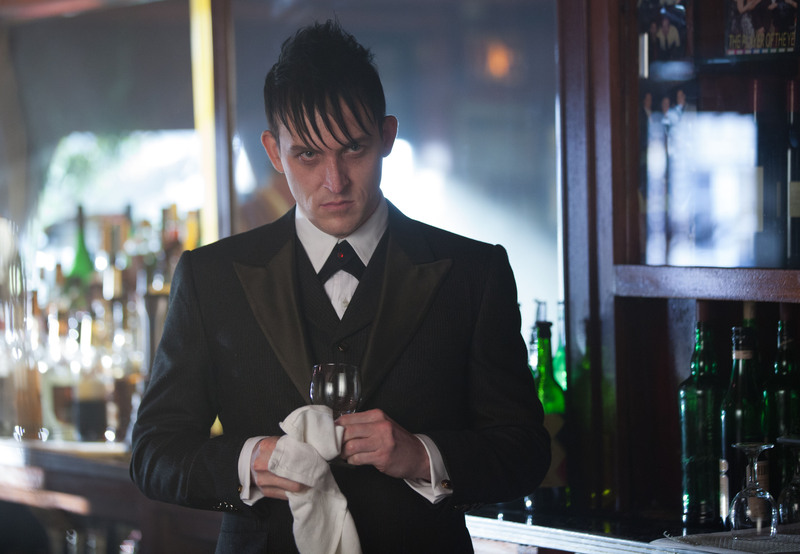 Of particular note are the scenes between Penguin and Nygma, and Penguin and Gordon. Cory Michael Smith as Edward Nygma. This episode gives us one brief but brilliant glimpse into the mind of Mr. Nygma outside of his awkward relationship with Ms. Kringle. Though he hasn’t quite made the turn yet, one could easily see how Mr. Nygma turns into The Riddler. Over the past few weeks I have mistakenly identified Ms. Kringle with a C as the first letter of her last name.